worker & queen described (see Bolton, 1995) . 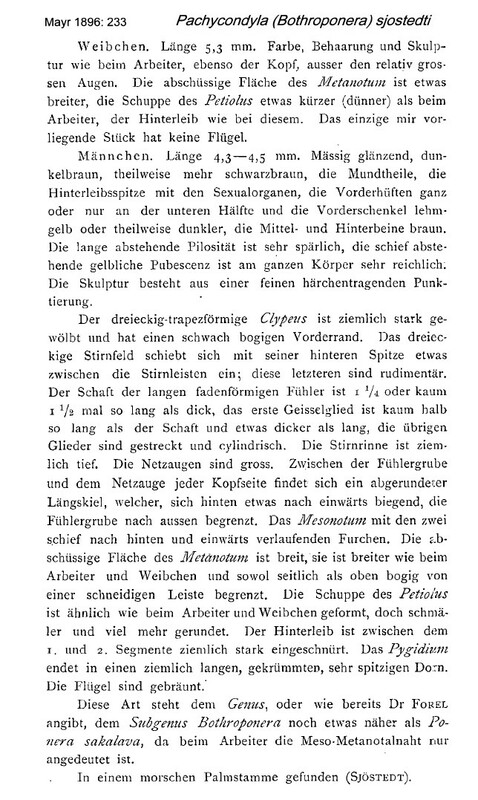 Mayr's (1896) descriptions are at . and, for the sexual stages, . Santschi's (1914d) description of the queen is at . 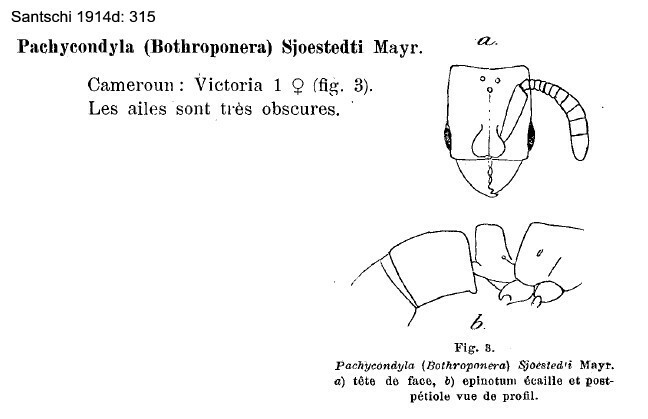 Wheeler (1922, illustrated, full profile and full-face head) had other Cameroun records from Victoria (F. Silvestri) and Mbalmajo to Ekeneli (G. Schwab); plus a Za飏e finding, where they were nesting in or under rotting palm trunks. Also found in Ghana cocoa, foraging and nesting in dead wood on the ground at the Mampong Cemetery farm (Room, 1971). Colour red-brown. All over reticulopunctate, dense and fairly coarse, except on posterior face of the propodeum which is smooth and shiny. Pilosity short and dense, tending to obscure sculpturation. Erect hairs moderately long and relatively abundant. Eye very small, recessed into head fairly close to the anterior margin. Mandibles with a distinct basal dorsolateral fovea. Propodeum distinctly marginate laterally. Wheeler (1922) regarded the small size (for Ponerines), pale colouration and eyes reduced to a few ommatidia as distinctive. I found it under a rotting log with termites. The photomontage is of a worker from Cameroun; Awae II; collector A Fotso Kuate (fk pachycondyla sp14). I collected this photomontage from the Antweb site at http://www.antweb.org/specimen.do?name=sam-hym-c007972 (posted 17.ix.2009). As can be seen it is labelled "Pachycondyla testacea" and identified by W L Brown. Pachycondyla testacea, now Mesoponera testacea, however is known solely from the Bernard (1952) description of a single worker. That is a typical Mesoponera (Xiphopelta) with long mandibles and small eyes set some distance back from the anterior margin of the head. Moreover, it is a shiny species with sparse pubescence. 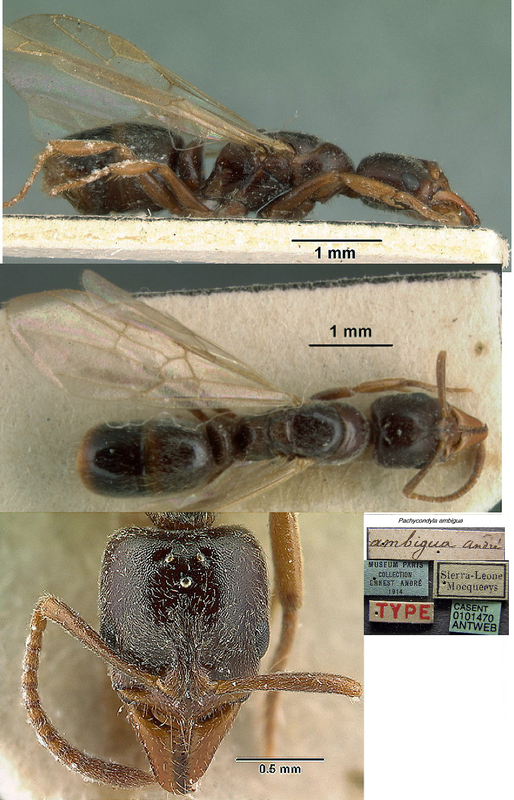 Few Xiphopelta queens have been described and only Mesoponera ambigua is shown in an image. That I repeat below. 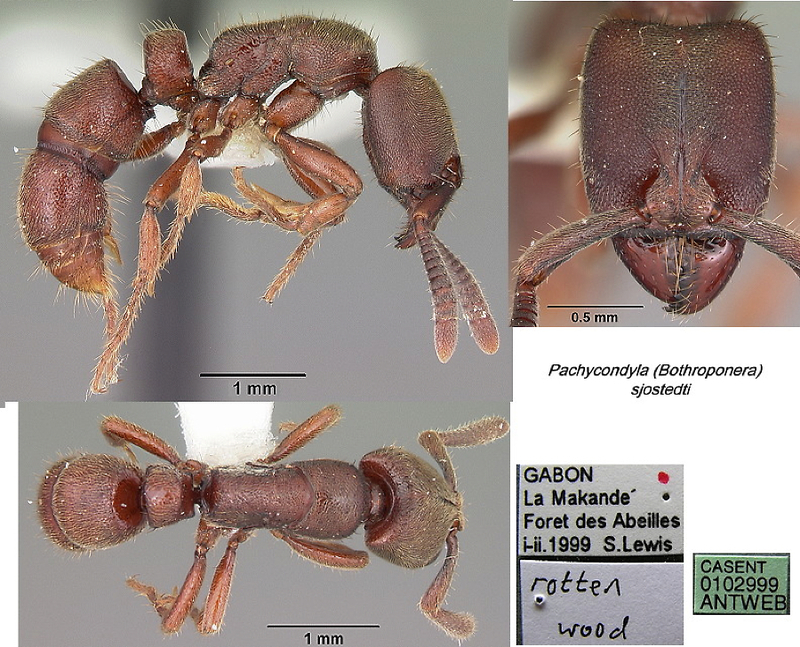 As described for the subgenus queens, it differs little from the known workers with long mandibles and only moderate sized eyes set back from the anterior margin. This Brown identified queen clearly is not the queen of testacea. The wing venation is similar to that of ambigua and, at least, places the species in Pachycondyla. Two features might place it in Xiphopelta - the long first funiculus segment and the median tooth on the anterior margin of the clypeus. 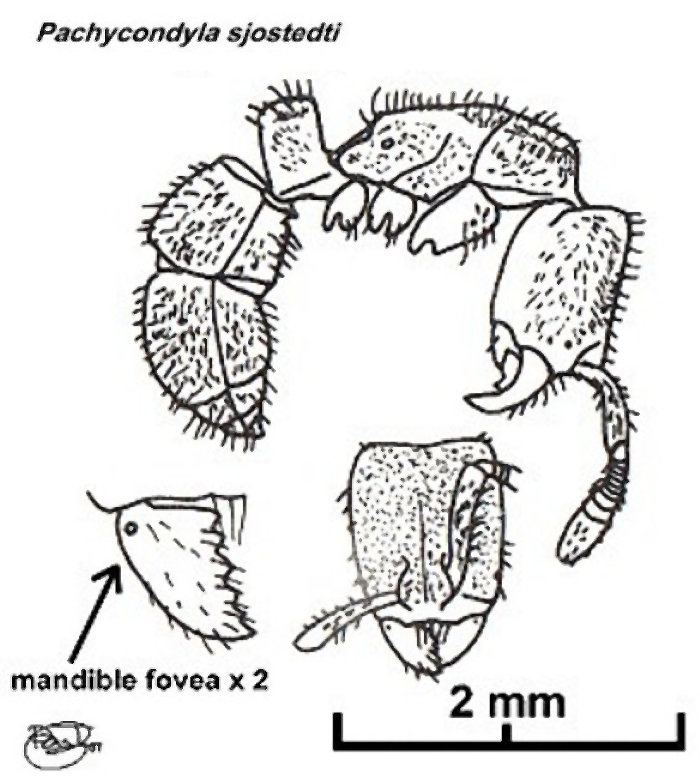 Now, June 2014, it appears as Parvoponera darwinii madecassa. Mayr has the sjostedti queen as TL 5.3 mm. The colour of the Ivory Coast queen seems paler than the Cameroun type forms but the overall features are a good match for the description and the later Santschi drawing.